An undercapitalized farmer, with access to land, could purchase a Speedy Seeder, $50. Made of metal it will last for years. They could buy a variety of seeds, enough for 40 shares for 26 weeks. They would know, week by week, exactly what the harvest will be, with no wasted seeds. They could spend time watering and picking bugs off and harvesting. Purchase 40 yards of compost and spread that in 3-4 inch depths over their land. Not use fertilizer or pesticide. Or gas or diesel. Total spend? Cost of land. Seeds...$1200. Compost...$1000. If there is a water source, water cost $1000. Speedy Seeder $50. Salvaged paper or old newspapers, nothing. Drip tape $350. Some hand tools at yard sales. And just like that. 40 more households eating local. Another business started. 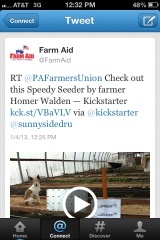 Our goal in bringing The Speedy Seeder to a Kickstarter campaign? To get 800 more people growing and eating for themselves or for others too. We are dreamers no doubt. But we are doers too, and people who love to eat too. Lets all eat carrots! Fresh from the ground, nothing like it.